people are currently registered to participate in this year's Great California ShakeOut. The beauty of the Central Coast evokes a sense of pride from residents, and attracts visitors worldwide. Those lucky enough to live in the region know how breathtaking the area can be. 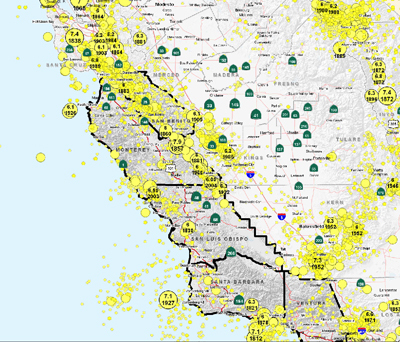 But like all of California, the Central Coast area is earthquake country. 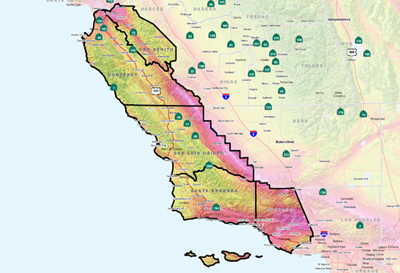 Since this area of California has so much quake activity, understanding the risks and preparing to survive and recover can help keep your family safe. Most people in the Central Coast live less than 15 miles from a fault that can have a damaging earthquake. The most frequent large earthquakes that will affect the region will occur along the San Andreas fault. The San Gregorio fault follows the coast, usually just offshore. Numerous other faults are capable of having moderate magnitude (but still damaging) earthquakes similar to the 1989 Loma Prieta earthquake. These earthquakes will disrupt services like electricity, water and sewer, and may limit access in and out of the region. Fire and police departments will be dealing with the most serious situations and may be unable to respond quickly to issues in your community. Government assistance may not be available or not enough to replace your damaged belongings or repair your home. Good news: Preparing now will give you confidence that you and your family will stay safe where the earth shakes. A larger earthquake in or near the Central Coast will disrupt the economy of the entire State and much of the nation. Effective disaster planning by State and local agencies, and by private businesses, can dramatically reduce losses and speed recovery. 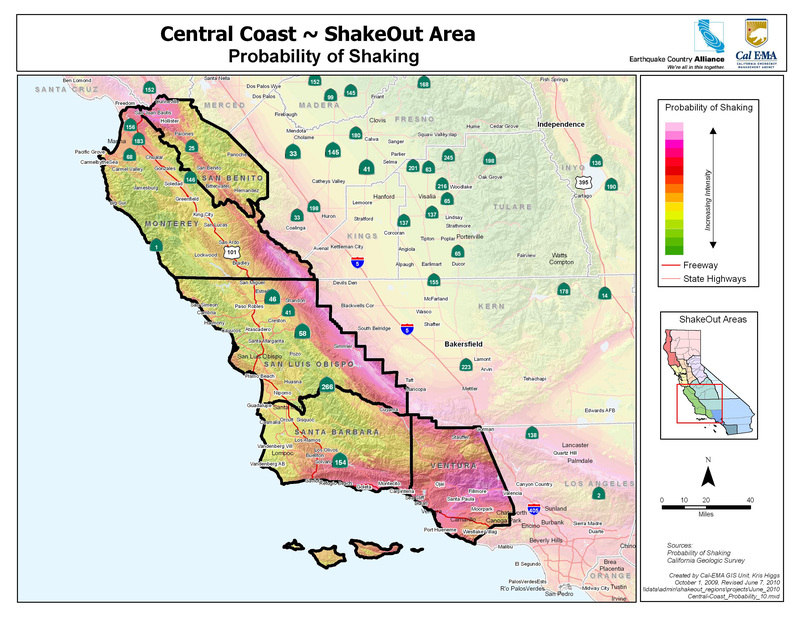 Earthquake Shaking Potential for the Central Coast Region. State of California. 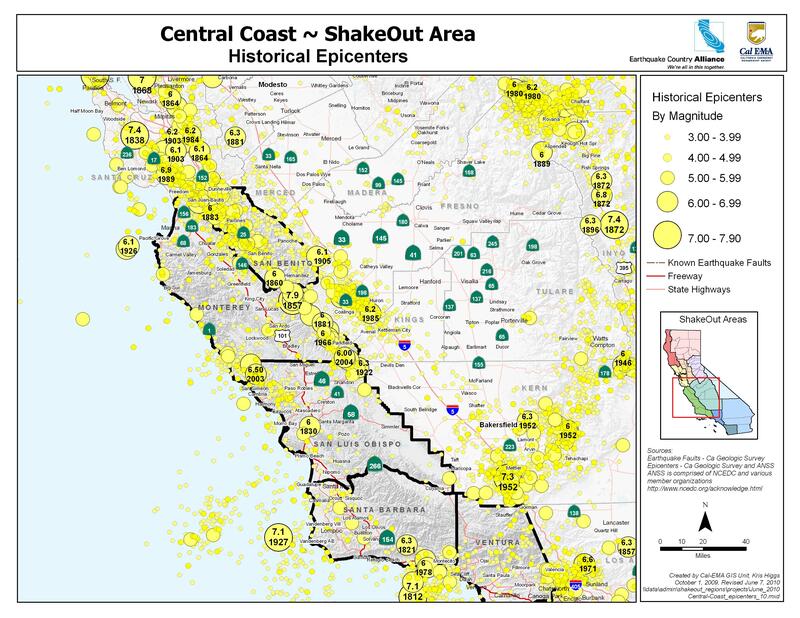 Seismologists are re-evaluating the earthquake potential of the Central Coast, a very complex tectonic region located west of the San Andreas Fault, between Monterey Bay and the Western Transverse Ranges. This area of increasing population growth ranks as one of the top 40 U.S. metropolitan areas with significant earthquake risk. 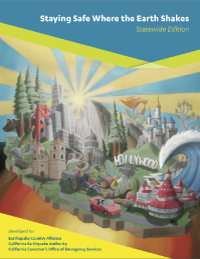 California’s Central Coast Earthquake Hazards: New Information for Recently Identified Faults. Science News.